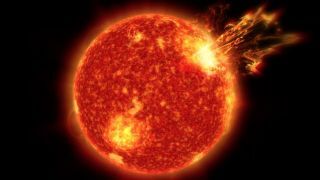 The solar particles are expected to hit as early as Thursday, February 14, but could arrive the following day. Auroras will shine in the sky as the charged particles hit gas molecules high in the atmosphere, causing molecules to glow. There's also a small chance that the storm will disrupt satellites or power grids.